Fans of Willie Cole have had ample opportunities to see his prints, sculpture, drawings, and photography over the past ten years, as three consecutive survey exhibitions—“Afterburn” (2004–2006), “Anxious Objects: Willie Cole’s Favorite Brands” (2006–2008), and “Deep Impressions” (2010–12)—have traveled to museums and university galleries across the United States. Patterson Sims, the curator responsible for the last two shows, sustains his singular dedication to Cole’s work with “Complex Conversations,” which will land at three more institutions after its current stop at the Weatherspoon Art Museum. Such a ubiquitous presence courts overexposure, but the compelling ways in which Cole’s work responds to social, political, and historical intersections of race, family, labor, and art while remaining visually inventive mitigate such concerns. Standout early works that use found consumer objects include Wind Mask, 1991, a small wall-hanging sculpture that resembles an African mask, which Cole assembled from vintage hair-dryer parts, and Collage 4, 1990, a large semifigurative arrangement of photocopies of similar hair dryers that evokes Mayan carvings or a South Asian deity. 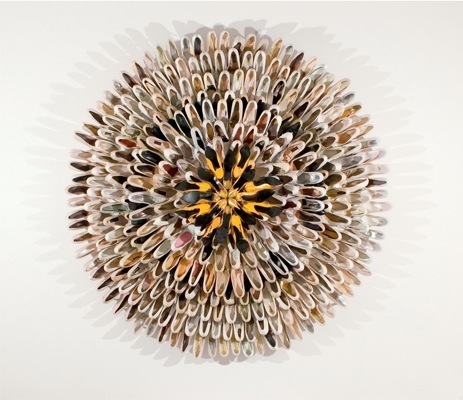 Another wall piece, With a Heart of Gold, 2005–2006, features beautifully organized concentric circles of white- and ivory-colored high-heeled shoes, with the inner core of tawdry yellow pumps radiating ebullient energy. The footwear becomes threatening in Throne, 2007/12, comprised of several hundred mostly black and red heels, their spiky stilettos pointing upward.